This was taken with Jake facing west, about 30 minutes before a serious rainstorm came in. You can see the reflection of the impending deluge in the windows behind him. 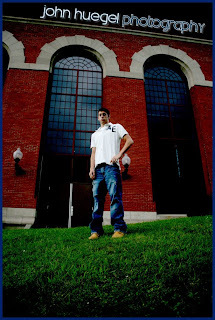 This was taken with a wide angle lens from the grass level to pick up the building behind Jake. The image was edited to show the strong colors and the dark environment of the overcast, stormy skies. Using the Curves function, the low and high ends were emphasized.